I was in the market for a bike that offered a different approach to riding than my current bikes have. I have a great gravel and dirt roads bike in the WR250R; and great touring capability with the Tiger 800XC. The Dakar was a middle of the road between these two. I was searching for something more street oriented. At some point I was hopeful the Husqvarna Nuda 900 would make it to our shores. That would be one sweet bike with that modified Rotax 800 parallel twin motor bored to 900 cc and a 270 degree crank on a light body and a nice upright riding position. 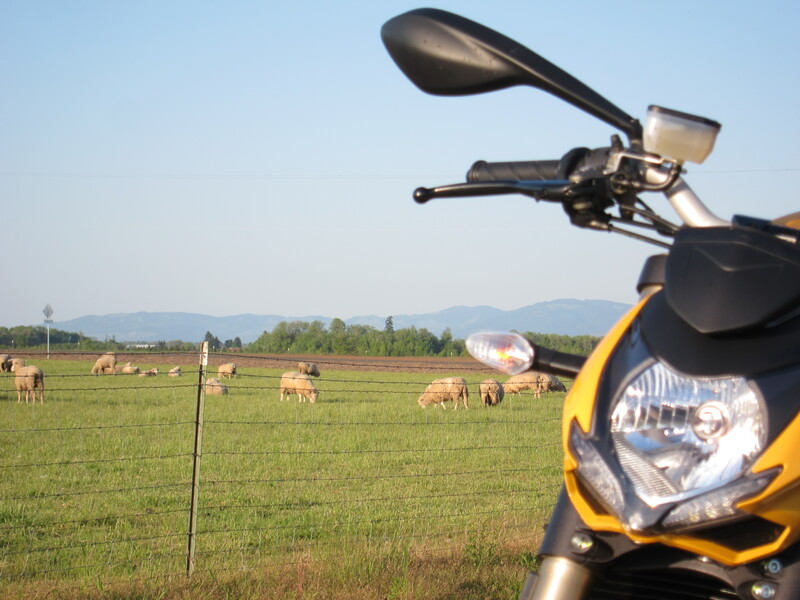 The Ducati Multistrada 1200 was another candidate, but it overlaps the touring use I already get from my Triumph Tiger 800XC. 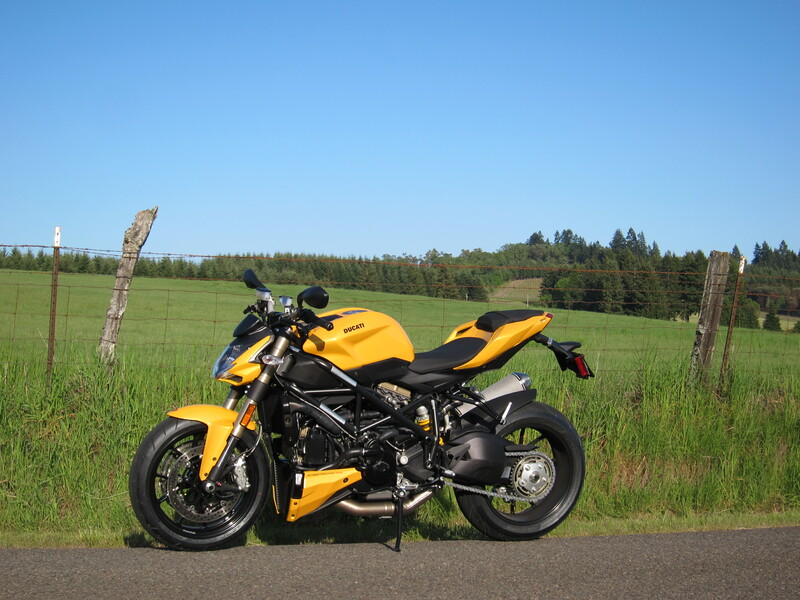 I thought about the Monster 1100 evo. I even thought about the Ducati Diavel. 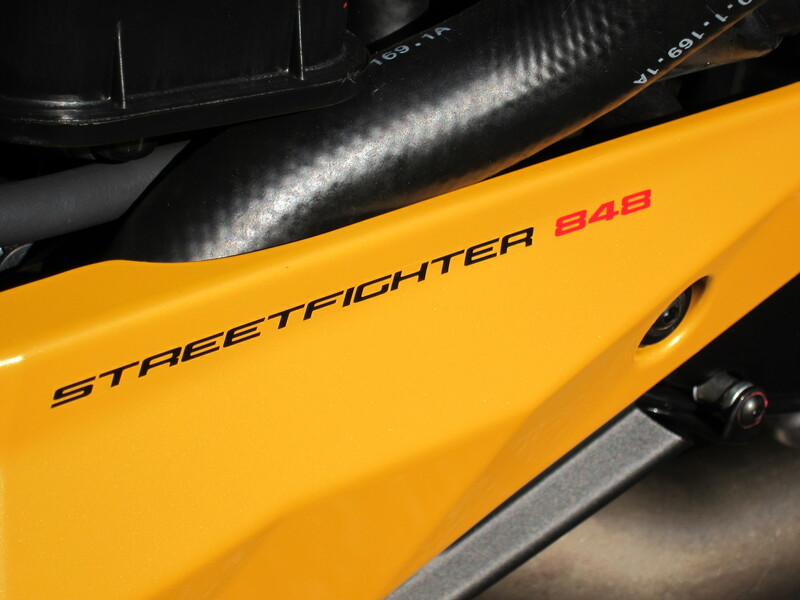 But then came along the Streetfighter 848. This bike caught my attention, especially for the changes Ducati made to the 1098 version of this bike. They put a Testastretta version of the 848 motor on this bike, with the 11 degrees valve overlap, similar to what is found on the Multistrada and Diavel, making it a unique motor on the Ducati line-up. What I will tell you, though, is that these changes were expected to result on a broader range for top torque figures, making this bike, although still powerful, more relaxed for all types of riding. And they accomplished this. Modifications were also made to chassis, handle bars, and brakes. All of these changes were designed purposefully to offer a tamer version of the 1098, a solid, middle of the pack naked bike, that was to be more versatile than its 1098 version. And that was accomplished as well, as I will report here. European Motorcycles of Oregon had two of these models just taken out of the box and getting ready for the show room floor. A matte black and a fighter yellow. When I saw the yellow under the sun, I made my mind. It is gorgeous. This thing looks great from whatever angle you look. It has a pearlescent finish to the paint, which highlights with different tones of yellow the nice angles of its design, under the sunlight. Photographs do not capture this well. I picked it up late afternoon on May 10th and I only had time to ride it home, all of three miles of distance between my house and the shop. The next day I left work earlier and took her for her maiden voyage, 120 miles through county roads, rolling hills in the area north and northwest of Junction City in Benton County. For the first 600 miles I’m limited to up to 6,000 rpm on the motor. That means this bike can not be ridden properly. 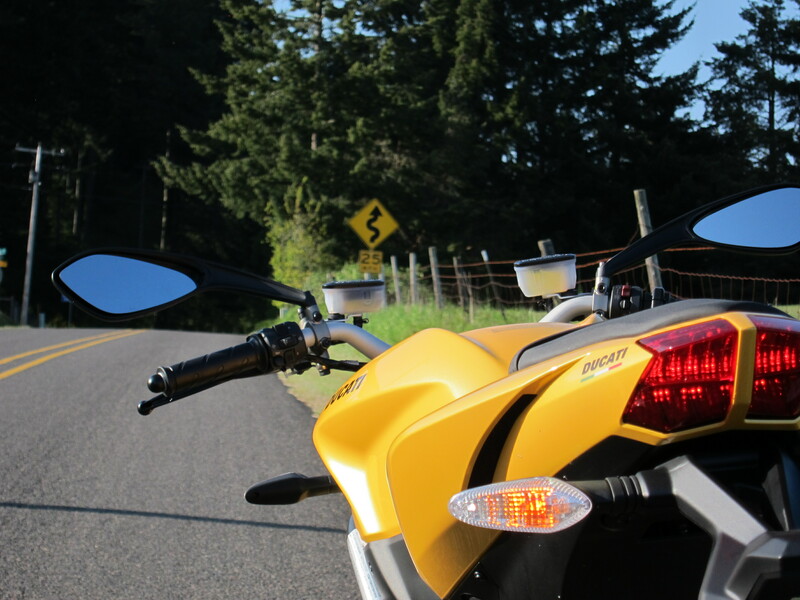 These low traffic country roads were perfect to ride at the motor break-in pace, keeping a close eye on the parameters of the bike. My impressions on these first 120 miles, limited by what can be done below 6,000 rpm are that this bike offers a very solid line on curves. As if it is on rails, inspiring much confidence. That was something Ducati wanted to provide with the chassis changes made and it accomplished this goal, it appears. The brakes are fantastic, offering great feel have very are solid actuation, and most importantly, they allow for gradual engagement when so requested. The acceleration, up to 6,000 is awesome. What will happen after that number? The bottom line, this bike is plenty of fun. More than I imagined possible. And it is a beautiful machine. The question is: will it be my favorite bike? 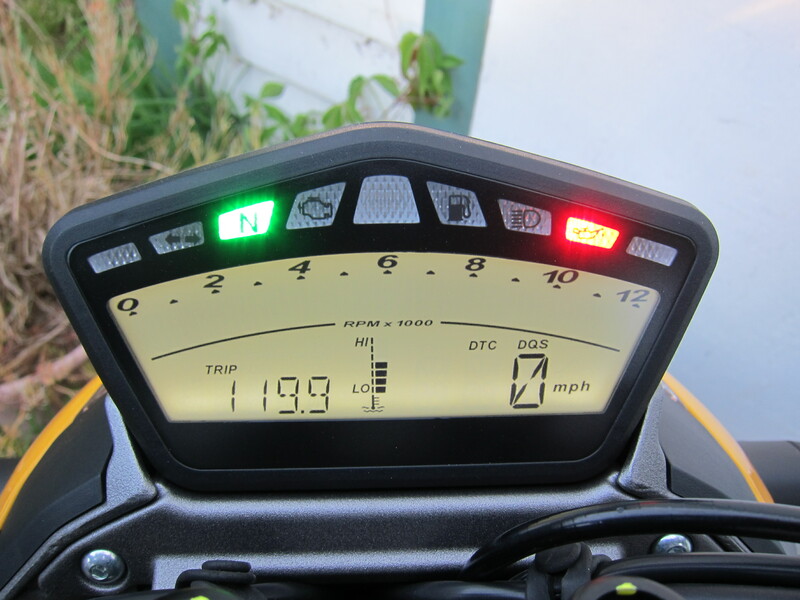 For a first step in answering this question, read my next report on this bike, when I took it for a 200+ miles loop. This next report will include a short helmet-cam video and more impressions on this bike, including my take on the Ducati Traction Control and fueling issues. 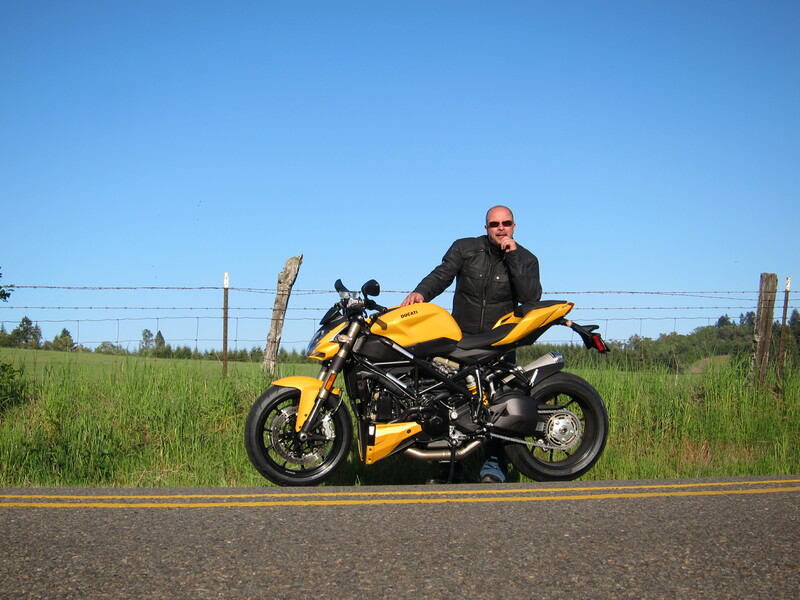 This entry was posted in Bike Reviews, Riding the Ducati and tagged 848, Ducati, oregon, Streetfighter. Bookmark the permalink. The bike looks scrumptious. Love the yellow! The seat seems a bit uncomfortable for longer rides, please tell. What farkles did you add? Or did the bike already come with the belly pan? 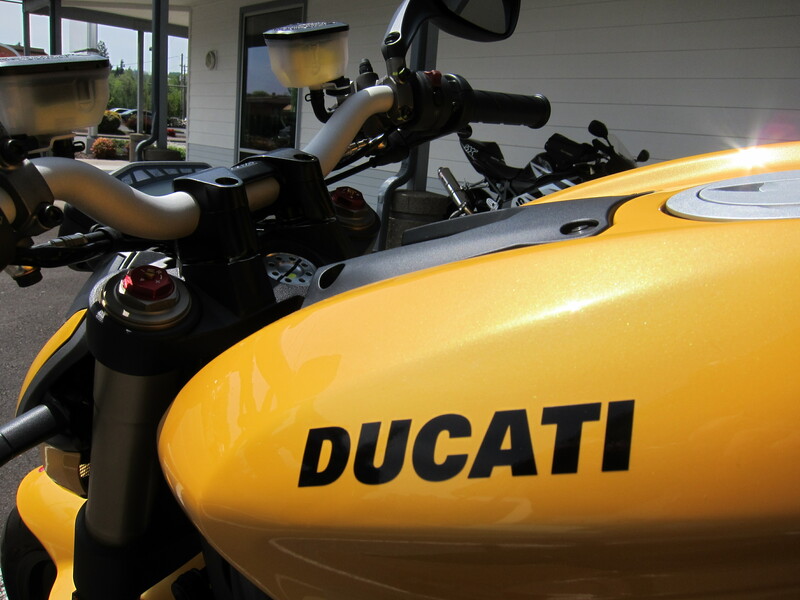 I just recently had the opportunity to ride a Triumph Street Triple, and your Ducati looks like a worthy opponent. Thanks for stopping by. Yes, this bike has a presence. I get a few thumbs up from people when I take it for a spin. And I agree with you, the Street Triple is very similar. I did not consider the Street Triple simply because I already have a triple motor in the 800XC. I confess I wanted a bike with the character of a V-twin motor. I’m glad Ducati is making efforts to make V-Twin motors better and better. The radical changes made to a V-twin, that was put in the Panigale, makes me think Ducati is committed to the V-twin concept for years to come. Hey Andre, this bike is somewhat tall. I’m 5’11 and it fits me perfectly. It might work for you. I would go to a Ducati dealer and test it before anything. Nice review. I’m in the market for a new ride, and it’s between this (in the yellow as well…I agree it’s sharp!) and the Speed Triple R. Hard to decide which way to go! Did you by chance take that out as well before purchasing this? Any feedback? My biggest gripe(s) with the SF were the lack of low end torque (where I find the Triumph crushes it), and the mirrors that don’t actually let you see anything haha. They’re pretty useless on this bike! Well, where do I start… although these two bikes are compared as similar bikes, I see them as completely different bikes. 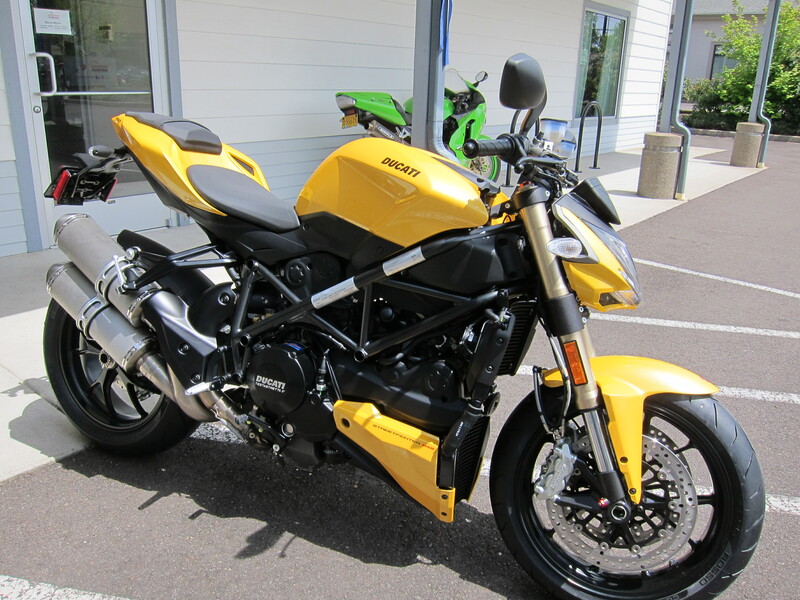 Although the 848 is called a “Streetfighter” I would not consider it quite that way. After almost 3,000 miles riding it, I would say it is great on a ribbon of asphalt climbing a mountain somewhere. Around town the ergos are a bit uncomfortable. In my opinion, when your body is lower it is more difficult to maintain the vision awareness you need to have in city traffic. The mirrors as you point out, are not helpful. And finally, the acceleration at the low bands of the RPM range are somewhat lumpy or nonexistent. However, when you hear that motor, it sounds raw. The riding sensation is visceral. The experience is incomparable to other bikes. 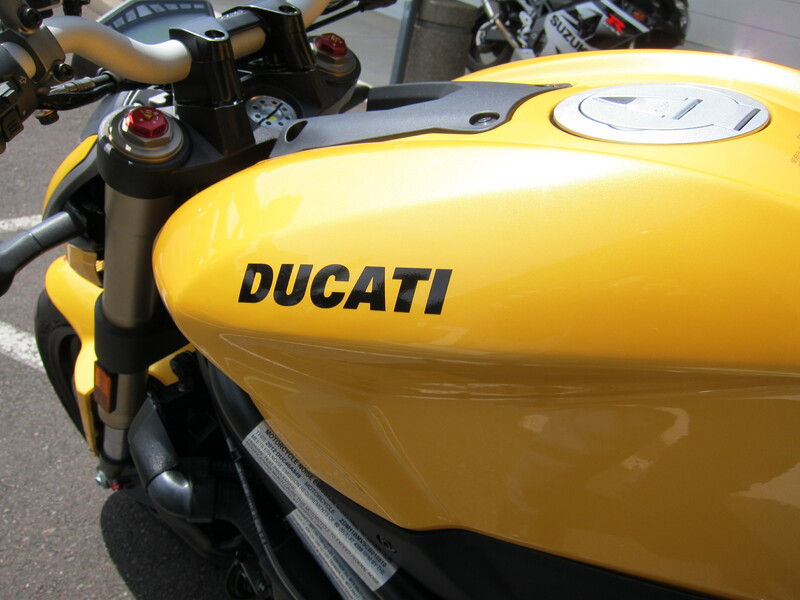 It is a Ducati and it has that unfinished feel you get when the start button is pushed. The Triumph is a well behaved bike, with a more upright position. It will do everything the 848 Streetfighter does, it will actually probably do it better than the Ducati in many respects. It is a more versatile bike from my parameters because it is better for city riding. But it won’t fall behind on the curvy roads out of town. So the decision is a very personal decision. Because I already have a triple motor in my stable (Tiger 800XC) I would buy the Ducati again if these two bikes were my only choice. Meanwhile, check the Hypermotard 820. That 820cc motor is an evolution of the 848 TestraStretta. Less power, but more refined. A more upright riding position. And there is a version (Hyperstrada) that comes with bags. The options have only improved, making decisions more difficult. Let me know what you decide to do. I’m curious to know how people make decisions considering all the options available. I’m getting one of it and the red one caught my attention. I heard that there’s no DTC in yellow SF848 but do in red SF848. Is that true? Or it just in my country they did so? Been looking for any article bout it but there’s nothing can feed me for that. I apologize for the long time in responding. No, that comment is not true. All SF 848’s have traction control with the 8 levels. The color does not have anything to do with it. However, you should know the yellow is only available for the 2012 models. It is discontinued for 2013. To me, it makes the yellow a special color. Hello Cesar, I am Francis from Macau. I order a black one,I really like the look of sf. I want to know if the dtc level will influence the horse power? Is the sf is difficult to handle the clutch and start since here always has traffic jam. Well… if you are going to handle traffic jams I would recommend the HyperMotard. Ducati is getting ready the new HyperMotards, with the 820cc motors. The HP have a more upright riding position, perfect for city riding. One of the versions will be called the HyperStrada, which comes with bags and a windshield, perfect for taking on small trips also. The Street Fighter has a much more aggressive stance. 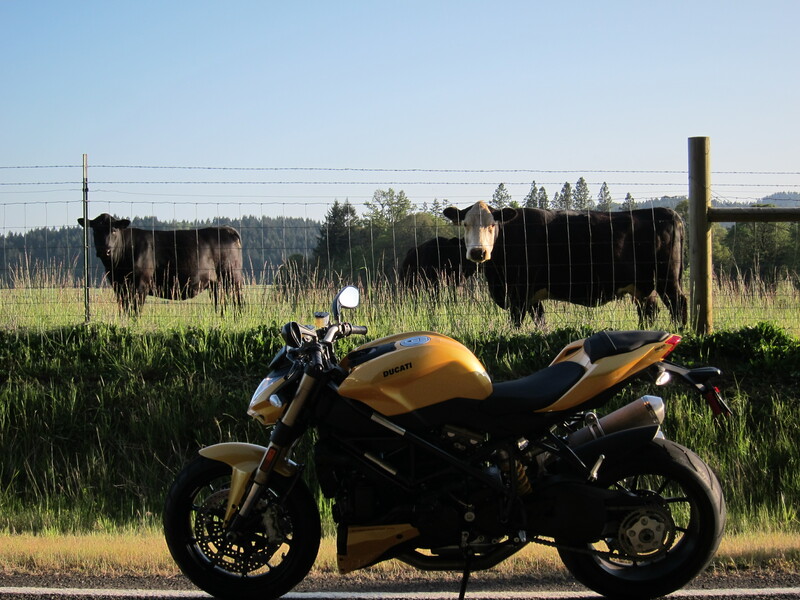 The 848 is not as aggressive as the 1098, but still… it can be brutal on low speeds. Also, the motor on the 820s will have the same changes made to the 2013 Multistradas which are much smoother for stop and go. The 848 is smoother than the 1098, but not quite there yet. But there is no question: the Streetfighter is beautiful from any and every angle.